The present grammar has been prepared with a view to meet the growing educational need of university students. The author has done his best to bring the present grammar up to the requirements of the students. In writing the various chapters of this book, the author has closely followed Pannini, as explained by Bhattoji Diksita. Many of the rules given here are translations of the relevant Sutras of Panini. The original Sutras are given in footnotes, where necessary. Sandhis and declensions are fully treated; compounds which dominate classical Sanskrit literature have received special attention; formation of feminine bases has been illustrated; Taddhita affixes have been arranged in an alphabetical order. A special feature of the present grammar is the chapter on the "Conjugation of Verbs." The general rules given are amply illustrated by examples. All the verbs which change their pada when preceded by particular prepositions are given in an alphabetical order. 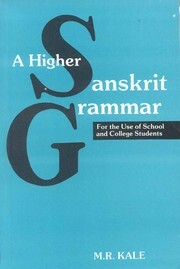 The chapter on Syntax contains almost everything given in the first 20 chapters of author's Guide to Sanskrit Composition; the chapter on Prosody is based on the Chandomanjari and the Vrttaratnakara. The author has spared no pains to make the book as useful and as complete as possible.